Control a full suite of of WiFi-enabled smart appliances to help you stay connected to your home, no matter where you are. Channels heated air from the top of the oven and circulates it around food on all sides for perfectly uniform baking and roasting. Accommodates even the largest meals. Covers more surface area for more even baking results. Offers a visually striking look that's easy to clean. 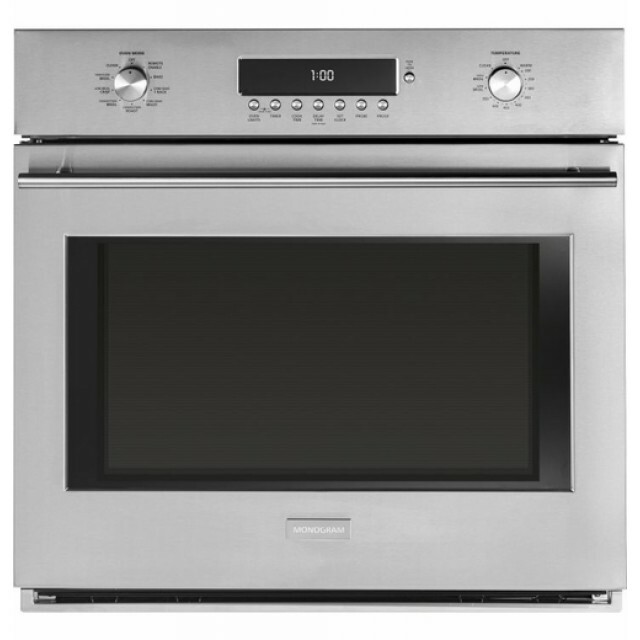 Located on both sides of the oven to enhance visibility and provide a clear view of food, regardless of rack position. Rotate with smooth precision. An indicator light in each knob makes it easy to view and select heat settings. Allows you to check cooking status with a quick glance. Glide in and out smoothly on stainless steel ball bearings, and are designed to be left in the oven during the self-clean cycle. Gives you flexible options for thorough oven cleaning. Evenly browns dishes of all types and sizes. Allows you to control oven functions from anywhere inside or even outside your home, using your smartphone or other web-enabled mobile device. Offers a stylish complement to the sophisticated exterior design. I bought the French door model. I bought this oven because I am only 5' tall and I was tired of getting small burns when I rotated food for even cooking. Now I can reach clear to the back of the oven, I do not need to rotate baking, and I can run the clean cycle without removing the shelves for separate soap pad attack. Great features and function. We replaced our 12 year old GE Monogram with this updated model. Love the ease of function, accuracy of the temperature settings, style of the front of the oven, sliding shelves and the crisp LED lighting. Appearance Like performance, not a fan of Stainless finish for cleaning.